Versatile sprinter John Degenkolb quickly established himself in the professional peloton, winning five stages of the 2012 Vuelta a Espana for the Project 1t4i team having only turned professional the previous year. The following season, Degenkolb won Paris-Tours, Paris-Bourges and the Vattenfall Cyclassics. But it was his ninth place in the 2013 Tour of Flanders that perhaps signalled what was to come. Degenkolb distinguished himself from pure sprinter and German team-mate Marcel Kittel by excelling in the classics and tougher, hillier races. Victory in the 2014 Ghent-Wevelgem, in addition to stage wins and points classification victories that year in Tour Méditerranéen, Paris-Nice and the Vuelta a Espana, as well as second place in Paris-Roubaix, underlined his credentials. 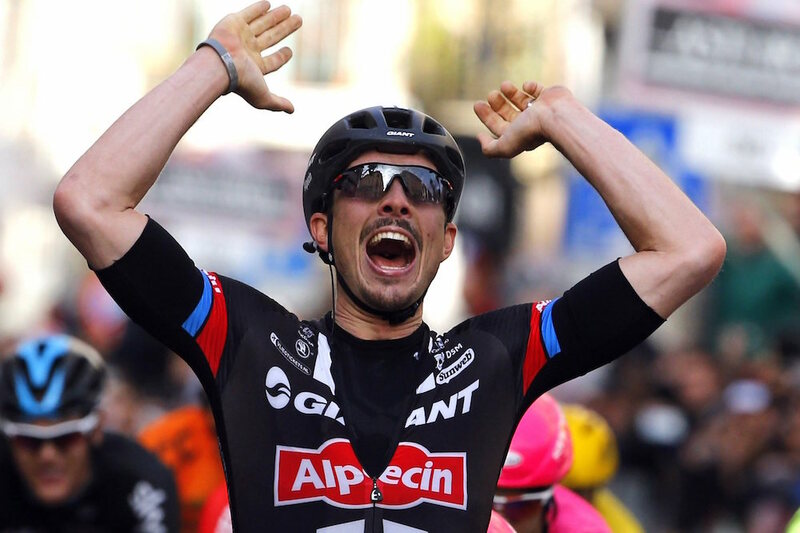 It was to be 2015 that Degenkolb really came good, claiming both Milan-San Remo and Paris-Roubaix, two of cycling’s biggest one-day races. 2016 wasn’t a great year for the German after a horror crash saw him nearly his index finger, ending his career in January. The majority of the year was spent rehabilitating the rider and nursing him back to health. It wasn’t until October that Degenkolb registered his first one day win following the his lay off. After a tough final year at Giant-Alpecin, the German joined Trek-Segafredo to begin anew. He notched his first win with them at the Dubai tour in Feburary with a win on stage three. He will go to the Tour de France hoping he can break his duck at the Grand Tour. John Degenkolb has launched a fundraising campaign to save the junior Paris-Roubaix race, raising more €10,000 in one day. Michael Matthews has registered his discontent after a spat with Tour de France stage 16 runner up John Degenkolb after the finish in Romans-sur-Isère. Stage winner John Degenkolb has criticised Dubai Tour organisers for not having a plan in place to deal with sandstorms that his the race on stage three. John Degenkolb (Trek-Segafredo) took victory on stage three of the Dubai Tour to move himself within touching distance of Marcel Kittel's overall lead.